Preheat oven to 180°C. Grease a 4 cup capacity ovenproof baking dish. Sift flour and cocoa into a large bowl, then stir in brown sugar. Combine butter, milk and egg in a jug, then slowly add to flour mixture. mix until well combined and smooth, then spoon into baking dish. 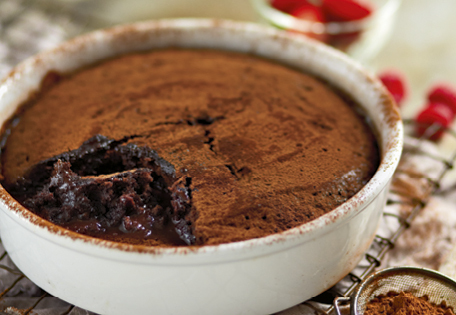 to make sauce, sprinkle combined sugar and cocoa over pudding. Slowly pour boiling water over the back of a spoon to cover pudding. Place dish onto a baking tray and bake for 35 mins. Serve hot with dusted cocoa powder, raspberries and ice cream.